Well, it’s not the Krampus I’ve been pining for, but it’ll do. UPS dropped this new-to-me Salsa Mukluk on my doorstep a few weeks ago, and I’ve been getting it set up the way I like it since. I made a few basic fit adjustments and swapped out the brakes and the rear cog. 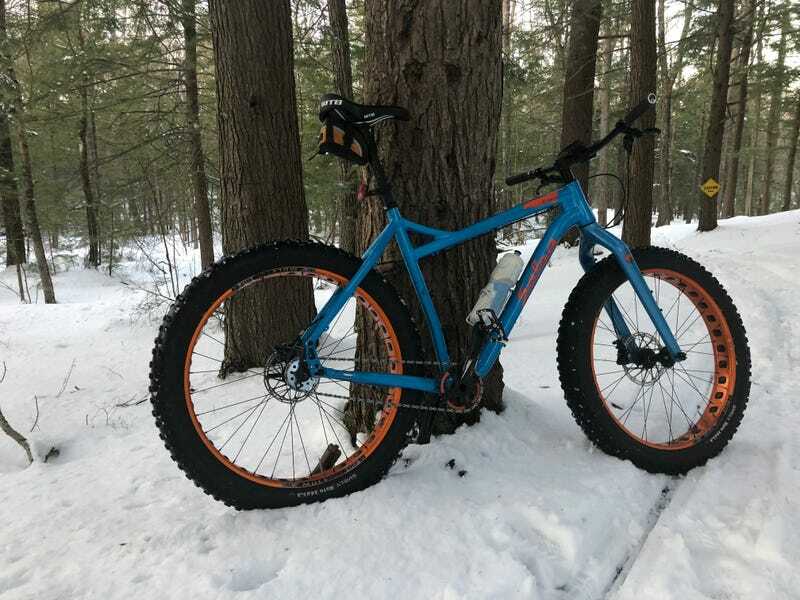 The previous owner set it up as a 32x18 single speed, which was a tad high to push through the snow. I swapped the cog for a 21 tooth, and now all is right with the world. I had it out on hard styrofoam snowpack late last night, and it was a ball. So Oppo, what are you riding this winter? P.S. : thank you to everyone who offered condolences a few weeks ago. I really appreciate it.